Looking for something fun to do during your vacation in Cancun, Playa del Carmen or the Riviera Maya? 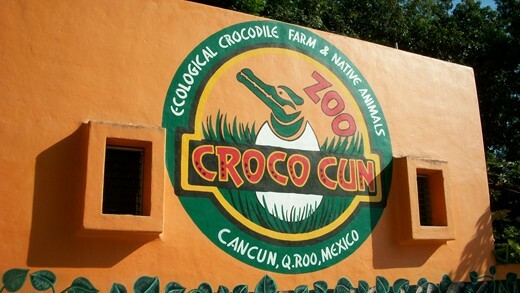 Crococun Zoo is a great place to visit for an hour or two. Crococun has been open for more than 20 years. Originally established as a crocodile farm, they are now a zoo dedicated to “educating and inspiring people to make informed choices that positively affect the conservation of animals and their habitats”. Guides accompany small groups through the zoo, located in the Mayan jungle just 30 minutes south of Cancun, and guests can interact with many of the animals. Maybe you would like to hold a baby crocodile? What about a snake? The monkeys and deer are especially fun to visit, because they are very tame and visitors can feed them. The monkeys are free to come and go as they please, but they prefer to hang around, probably because of all of the bananas they are fed! You definitely won’t see any lizards or snakes like these hanging around your resort! Perhaps the most interesting part of the zoo is where guests walk through an area in which crocodiles roam free. They are regularly fed and very used to guests, so they completely ignore humans as they stroll by. Crococun in the Riviera Maya is a wonderful place to visit with your family or friends. It’s an experience that you will never forget! hi i am coming to Hacienda tres rios on jan 26th 2014 to the 30th…i was interested in doing a tour to Tulum, the dolphin experience and the crococun zoo but i would like a little more information including whether transport is provided to and fro and the cost and length of time.i would be most appreciative if i could get an early reply….thank u! Hi Neera, you can call 1 800 494 9173 and ask to be transferred to the travel agency and they can give you detailed info on all of these tours. See you soon!